This implies that the promotor is not part of the gene. Is there an accepted gene definition regarding the DNA elements? Thus which sequences like promotors, enhancers, silencers etc. are considered part of the gene? Usually a promoter is not considered a part of the gene. Distal regulatory elements qualify even lower for being considered a part of a gene because they can regulate many genes simultaneously. Basically, a geneic region starts from the transcription start site (TSS) and ends at the terminator (or polyadenylation/cleavage site in eukaryotes). If a gene gives rise to multiple transcripts, those which have similar products (no frameshifts) but different TSS/terminators, we should consider the geneic region as a union of all the primary transcripts produced from that site. A gene is a genomic sequence (DNA or RNA) directly encoding functional product molecules, either RNA or protein. In the case that there are several functional products sharing overlapping regions, one takes the union of all overlapping genomic sequences coding for them. 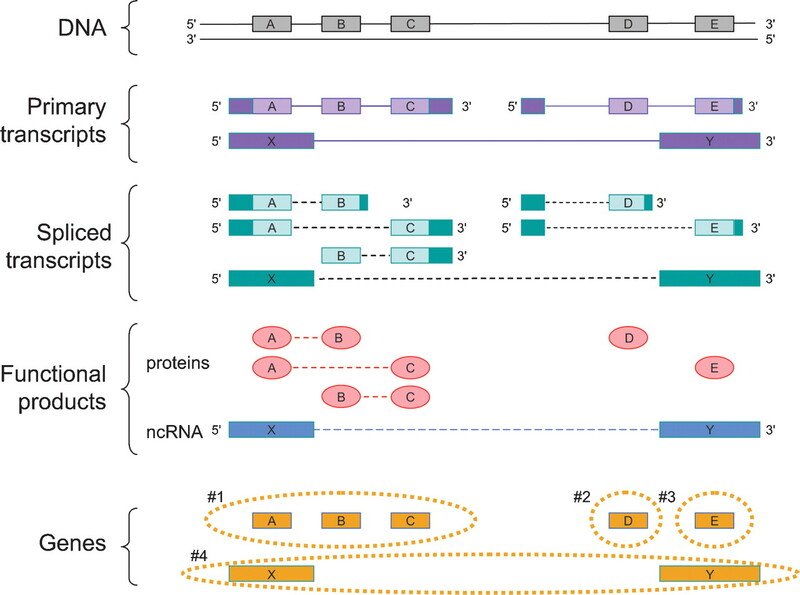 This union must be coherent—i.e., done separately for final protein and RNA products—but does not require that all products necessarily share a common subsequence. The gene is a union of genomic sequences encoding a coherent set of potentially overlapping functional products. My summary is that a gene, if it codes for a protein, would be a union of all primary transcripts that produce identical proteins (originating from transcripts with different TSS/terminators) or splice variants. Ideally, all the different transcripts produced from the locus would have the same promoter. Overall, it appears that a common promoter is imperative for considering the different products under the same gene because if two products are produced from different promoters then we consider them as products of overlapping genes. Whether we should consider the promoter as a part of a gene is an open debate. It depends. There are two broad definitions which work. The more common definition of a gene is the transcribed portions of DNA, a gene begins at the transcription start site and ends at the Poly-A site. This is common when discussing mRNA, lncRNA, tRNA. It's what most scientists refer to when they say the ACTB gene or IRF5 gene or something. If you want to explicitly include all introns you say 'Gene Body', if you want to exclude introns you simply say ' ACTB Exons'. An older and arguably better definition of the gene from Thomas Morgan is a unit of heredity, that when mutated results in a phenotype. The second definition doesn't say anything about transcription and would be inclusive of things like promoter/enhancer mutations. From a molecular biology stand-point is more difficult to define. It's more useful for genetics because you're interested in how a phenotype is inherited and it's etiology, not how an a species of RNA functions. 98% of the time when people discuss genes they mean the former definition, but this is still an actively debated issue and as we learn more about genetics it will change. Not the answer you're looking for? Browse other questions tagged genetics molecular-genetics terminology genomics gene or ask your own question. Which gene regulatory network is the largest in human?